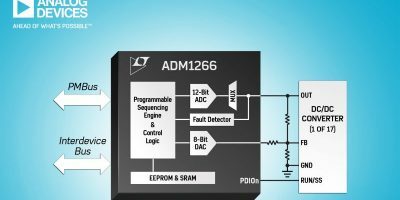 For monitoring, sequencing, and margining up to 17 power supplies, the ADM1266 Super Sequencer has been released by Analog Devices (ADI). The Power by Linear device has a proprietary two-wire interdevice bus which synchronises the operation of 16 ADM1266s, for larger rail counts. A built-in sequencing engine monitors each supply fault detector, general purpose inputs/outputs, and timers to turn the supplies on and off in a user-determined sequence. All configuration is performed through the ADI Power Studio GUI. The ADM1266 provides a highly flexible solution to manage complex power systems on FPGA, ASIC, and processor boards in network routers and switches, servers and data storage systems. The ADM1266 integrates an ADC and nine voltage output DACs that adjust the feedback node or reference of a DC/DC converter to implement a closed-loop, autonomous margining system. A non volatile EEPROM records voltage, time, and fault information when instructed by the sequencing engine configuration, speeding fault debug. When used with the company’s Power Studio software, the ADM1266 offers a configurable state machine to meet complex sequencing requirements. There are integral debugging features like breakpoints and black box, along with the software setup wizards to reduce development and debug time from days to hours, says ADI. The interdevice bus between multiple ADM1266s ensures they perform like a single device, providing for an intuitive design process. Software handles all complexity from 17 to 257 rails, adds ADI. Operating over the temperature range -40 to +85 degree C, the ADM1266 is offered in a 64-pin 9.0 x 9.0mm LFCSP package. Evaluation circuit boards are also available, together with device samples.